In March 2017, Jacob Zuma, the President of South Africa, exercised his prerogative and reshuffled his cabinet while the country slept; some reports say it all happened around midnight. Soon after that, the country’s sovereign credit rating was downgraded to junk status by Fitch and Standard & Poor’s, two of the world’s three major credit rating agencies. 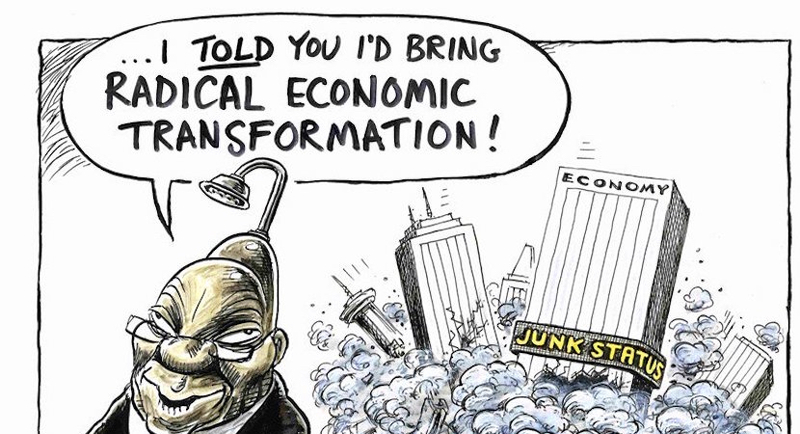 A number of South Africa’s key State Owned Entities (SOEs) and all major banks were also subsequently downgraded, reportedly to bring them at par with the national sovereign credit rating status. 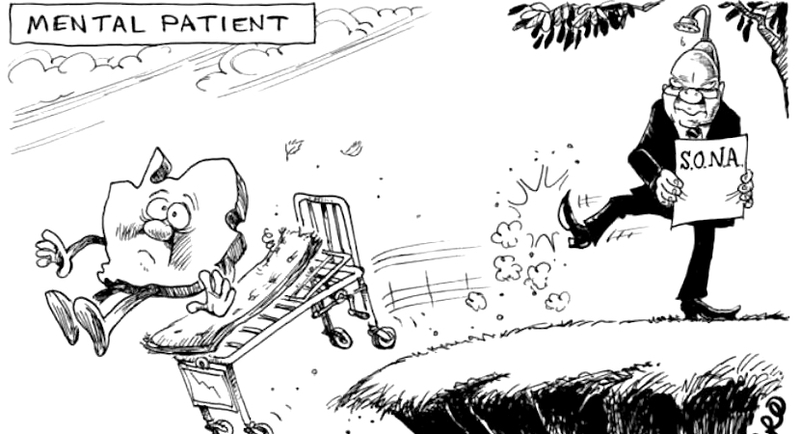 As if that were enough, Moody’s, the third rating agency, has this month decided to downgrade South Africa’s long-term foreign and local currency debt ratings by one notch, from Baa2 to Baa3, with a negative outlook, but keeping it at investment grade. The agency cited the weakening of South Africa’s institutional framework, reduced growth prospects reflecting policy uncertainty, slower progress with structural reforms, and the continued erosion of fiscal strength due to rising public debt and contingent liabilities, as reasons for its move. None of the above came as a surprise to anyone who would have been observing the evolving political and socio-economic environment in South Africa since President Zuma came to power, back in 2009. This is a President who arrived into office with the long arm of the law trying to grab him by the shoulders but he had managed to stay two steps ahead of its reach. Before taking office, he had made sure to get a well trusted and upright Director of National Public Prosecutions fired from his job following the latter’s refusal to give assurances that he would not pursue some 783 criminal charges against Jacob Zuma. The charges were subsequently dropped under mysterious circumstances by a hand-picked acting replacement with an unknown record. Ever since, at the core of decisions taken by the President and those around him have been in appointing people to protect his sense of self-preservation, which has been elevated to unhealthy proportions by the skeletons said to be piling up in his closets. State Owned Companies (SOCs), which typically manage billions of Rands, have also not been spared from inappropriate appointments at board and executive levels. To date, many instances of corruption and other forms of abuse of public funds and the repurposing of public entities, apparently to serve the interests of the President and selected rent-seekers around him, have been exposed. The Pretoria High Court has also ruled that the 783 charges had been dropped for all the wrong reasons and that they should be reinstated; but this ruling is being challenged by Zuma himself and the current Director of National Prosecutions, known to be at the beck and call of the President. The recent descent of the South African economy into a technical recession does not help the situation, as it gives more blows to domestic spending and investor confidence. 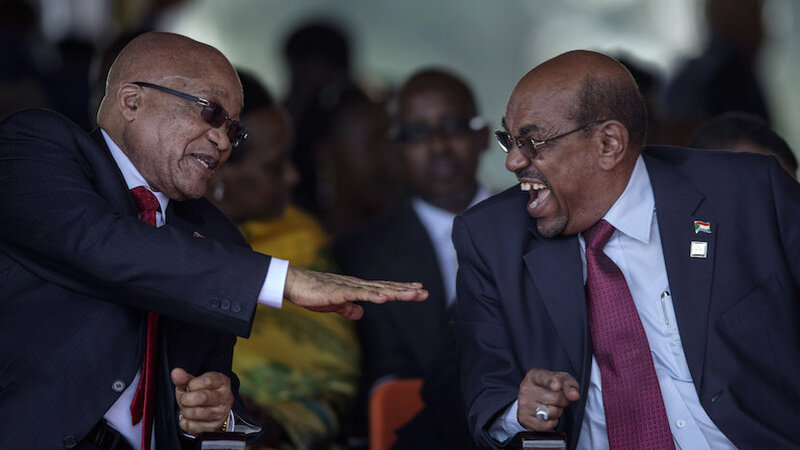 Much of the world was taken aback when, in 2016, South Africa, a signatory to the Rome Statute and a member of the International Criminal Court, decided to renege on its international obligations and enabled Sudanese President Omar al-Bashir to escape possible arrest for alleged human rights abuses in his country. This was despite a clear court judgment for his departure to be prevented. South Africa was also criticised for choosing to abstain from voting in favour of a UN resolution aimed to protect the lives of Gay, Lesbian, Bi-sexual, Transsexual, and Intersex (LGBTI) communities, worldwide. This despite the country having enshrined in its Constitution and Bill of Rights the protection of such human rights. It justified its decision as an attempt to avoid being out of pace with its African peers, many of whom still harbour punitive legislation against LGBTI communities. All of the above and a whole lot more has had a debilitating effect on the once shining domestic and global image of South Africa. Whereas the country used to be regarded as the biggest economy in Africa, a good base for foreign companies wanting to establish a footprint in Africa, reports show that it has been relegated to position three by Nigeria and Egypt. Some foreign companies have even decided to move their African Headquarters from Johannesburg to places like Nairobi, Kenya. More companies are said to be considering their relocation options following General Motors’ decision to pull out of South Africa after some 90 years in the country. It cited poor market performance as its reason. At home, corporate South Africa is said to be holding on to an estimated R720bn that is not being invested in the local market; a reasonable caution by fund managers fearing volatility in a political environment where Zuma supporters have resorted to racial blackmail and threats against the white business community. No doubt, South Africa’s reputational fortunes began to drop soon after the departure of former President Nelson Mandela from Public Office. Whereas Nelson Mandela mastered the art of reaching out to all South Africans, even those he fundamentally differed with philosophically, the leaders who came after him have almost consistently failed to measure up to his humanity. Under his leadership, he converged the diverse interests of South Africans from across the board; their hopes, their fears, their aspirations and their desire to invest self in ‘project New South Africa’. Despite the unfinished business of resolving a number of lingering legacy issues, confidence in the country’s future was at an all-time high. Elsewhere in Africa and in the broader African diaspora, the Mandela-led South Africa was seen as an opportunity for blacks to prove they could successfully lead the most industrialised economy in Africa without repeating mistakes made elsewhere on the continent. South Africa was seen as a country of hope, promise and over time, a preferred alternative destination for hordes of African economic and political refugees fleeing hardships in their own countries. Many switched from considering Europe to coming to South Africa, believing that they would feel more at home in a better managed and led African country. As the only African country with a progressive Constitution and Bill of Rights that enshrined the rights of LGBTI communities, it also attracted many members of this community who fled possible persecution in their countries. 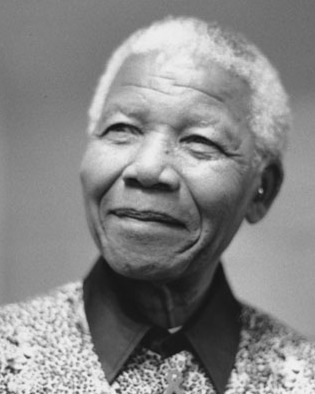 In his own right, former President Nelson Mandela became a magnet that attracted thousands of famous people in politics, the arts, sports, academia, religion and many other areas of human endeavour to the country. All of them insisted on having photos taken with him before returning to their respective countries and later became positive influencers for South Africa. Such activities generated a lot of goodwill for the country and positioned it as an attractive destination for discerning investors, tourists, foreign students and dollar millionaires seeking a place to purchase secondary residences. Billions of Rands in foreign currency poured into the local economy through such exchanges. No doubt, Mandela was an effective representative for the aspirant brand South Africa, at home and abroad. SA Brand Summit and Awards were founded in 2016 to provide a politically neutral platform for South Africans and friends of the country to discuss the evolving image of South Africa from a country/nation brand perspective. The ultimate aim is to agree on ways to restore sanity to it. Recognise, award and celebrate the brands that make South Africa shine. 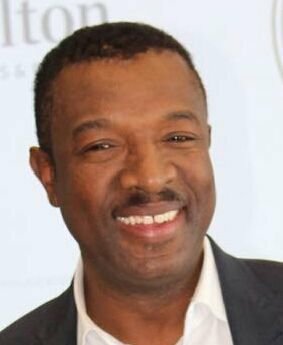 *Solly Moeng is brand reputation management adviser and CEO of strategic corporate communications consultancy DonValley. He is also the convenor of the SA Brand Summit & Awards.